Jeff - As I've been saying, the Fukushima-caused Arctic ozone hole is enabling all sorts of electro-atmospheric effects. There is no blackened burnt grass in the photo. This is not normal cloud generated lightning, but more like a cosmic storm. If this continues, there goes the atmosphere and the Earth's electromagnetic shield. Same electro-atmospheric effects killed thousands of saiga deer in Siberia. 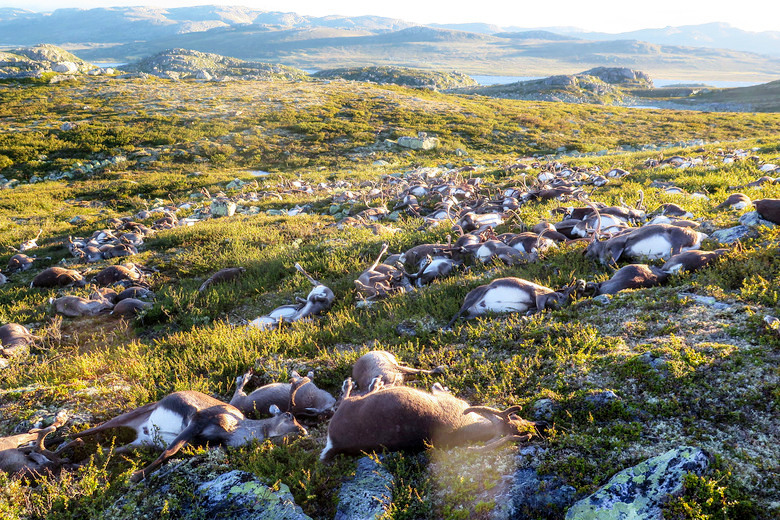 The 323 reindeer, including 70 young, were found on Friday by a gamekeeper on the Hardangervidda plateau, a national park where Europe's largest herd of some 10,000 wild reindeer roam freely. Television footage showed the animals' dead bodies lying close together on the ground. Reindeer are social creatures and usually move in packs. "It's unusual. We've never seen anything like this on this scale," Knutsen said. Norwegian authorities have yet to decide what to do with the animals. "We're going to decide soon whether to let nature run its own course or whether we will do something," he said. The reindeer deaths look to be an electro-shock, high energy but without conversion to heat (thermal power). The electric force is high but efficiently transferred between the atmosphere to the ground, and not a rebalancing or equalization of current between ground and air. It could be called 'cold lightning' but it is not actually lighting from electrons moving in a vapor column. The air is dry, and so it is a jolt of energy from the upper atmosphere (like a sprite or a jet) moving down to the ground, caused by ionization of atmospheric gas atoms by gamma radiation. It would be very serious if the phenomena is even more directly caused by radioactivity as a "gamma burst" - the death ray of sci-fi. Gamma-ray bursts are brief, intense explosions of high-frequency electromagnetic radiation. These outbursts give off as much energy as the sun during its entire 10-billion-year lifetime in anywhere from milliseconds to minutes. 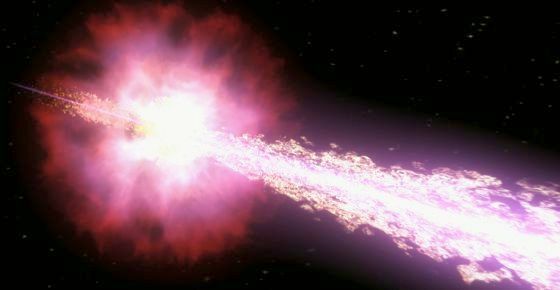 Scientists think gamma-ray bursts may be caused by giant exploding stars known as hypernovas, or by collisions between pairs of dead stars known as neutron stars. These findings suggest that a nearby gamma-ray burst may have caused one of the five greatest mass extinctions on Earth, such as the Ordovician extinction that occurred 440 million years ago. The Ordovician extinction was the earliest of the so-called Big Five extinction events, and is thought by many to be the second largest. 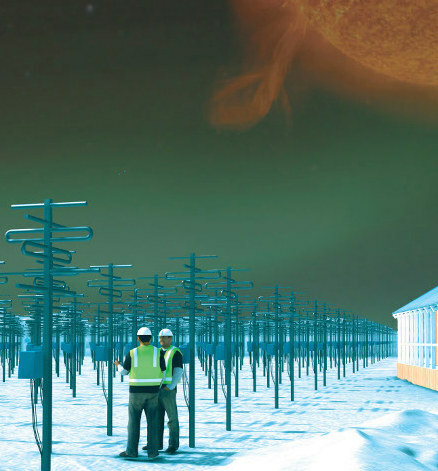 There is a massive HAARP array in Norway by the way. I would expect that was the cause. In fact it may have been the test of a new weapon to warn mother Russia not to mess with NATO.